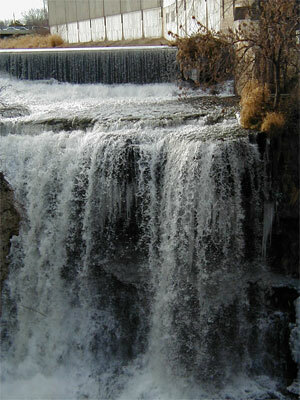 The Vermillion Falls in Hastings. The new Vermillion River Watershed standards will help keep this resource cleaner and safer for everyone. In fall 2006, the Vermillion Joint Powers Board, the board responsible for implementing a watershed management plan that governs the Vermillion River watershed, adopted a set of new standards that dramatically improved upon the draft standards initially proposed. Friends of the Mississippi River played an important role in influencing the final standards. In preparation for the fall 2006 decision, we distributed our Vermillion River Watershed advocacy packet to 2,500 Watershed residents in May 2006. FMR and eight other organizations mailed a joint letter to watershed residents, and packets were mailed to members of FMR, Trout Unlimited, Clean Water Action, The Sierra Club, Pheasants Forever, The Nature Conservancy, the Southern Dakota County Sportsmens Alliance and others. The packet contained a fact sheet on stream buffers and stormwater Best Management Practices, a Protect the Vermillion bumper sticker, and a call to action for the Vermillion JPO Board to enact protective stormwater and buffer standards. At the May 25th 2006 public hearing, over 600 watershed residents delivered postcards to JPO Board members asking them to implement strong stream buffer standards on all perennial and intermittent streams in the Vermillion Watershed. With almost a dozen public comments in favor of enhanced watershed protections at this hearing, FMR and our partners represented the vast majority of public comments on the proposed Standards. Visitors to our website found fact sheets and historical narrative on the Vermillion as well as a Vermillion Watershed action page that helped them send letters to JPO Commissioners and letters to the editor for all print media outlets serving the watershed. Our website also hosted maps and other information about the Vermillion Watershed and talking points for clean water advocates. The Vermillion Watershed, in cooperation with Dakota County, has developed a septic system inspection and abatement program to begin addressing the bacteria and other contamination seeping into area wells, groundwater and into the Vermillion River. This program is almost exactly what FMR and area residents advocated for from 2004 to 2006. An on-going age-based assessment of every septic system in the floodplain of the Vermillion River is underway, and for those built before the adoption of current insulation standards, an inspector will conduct an on-site evaluation of the system. The owners of systems deemed not in compliance, including those currently leaking pollutants into the groundwater, will be required to update their systems within a specific timeline and will be provided with low-interest loan options to meet the requirements. To find out more about this program, visit Dakota Countys program web page. In the next year, FMR will be instrumental in developing an innovative, market-based pollution-trading program in a joint effort of the Vermillion Joint Powers Organization and the US Environmental Protection Agency. The Vermillion JPO (with help from FMR and the Dakota County SWCD) was awarded an extremely competitive EPA grant in 2005. The EPA grant funds the development and implementation of an innovative stormwater credit trading program through the Vermillion Watershed JPO. It will be similar to existing market-based pollution trading programs. This program will reduce stormwater runoff across the watershed by allowing developments to offset thermal loading (heat pollution) to Vermillion River and its tributaries. These offsets, or credits, will offer a menu of low-impact development and restoration activities that reduce thermal, nutrient and sediment pollution while improving overall water management within the watershed. FMR is active in the Vermillion Technical Advisory Group and EPA workgroup charged with the development of this program.